Warm two tablespoons olive oil in a medium saucepan over medium heat. Chop the onion and mince the garlic. Add them to the saucepan and sauté for several minutes until the onions soften and start to turn translucent. Add the juice, wine, vinegar, and herbs. Bring to a boil and then bring down to a strong simmer. Stir occasionally until the contents have reduced to about 1.5 cups liquid or for about 20 minutes. Using a strainer, drain the contents of the saucepan into a small saucepan. Discard the solids. To the small saucepan, add the half and half and simmer all until it thickens to a sauce likeness. Meanwhile, quarter the pear and remove the core. Cut the pear into quarter inch slices. Add a drizzle of olive oil to a large skillet over medium heat and warm. 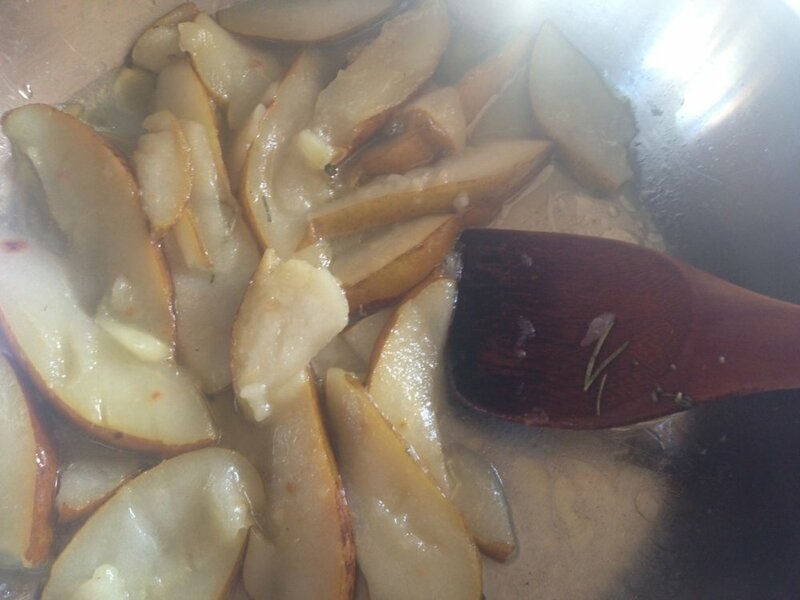 Add the pears and sauté gently until they are golden. Remove them from the skillet and set them aside on a deep plate reserving their juices as well. To the same large skillet add another tablespoon of olive oil over medium-high heat. Place salt and peppered chicken breasts in the skillet and brown on both sides. When the chicken is nearly cooked through, pour in the Marsala and bring to a boil. Add the sauce to the skillet and coat the chicken well. Plate the chicken and the pears and spoon the sauce over both. Enjoy!